The numbers show why it is getting tougher for architects to design courses for the best players. While designers should concern themselves with making challenging forward tees, players should also make a point of picking the best tee to fit their game. Are some of the holes on your home course always a little too long for you to reach in regulation? Do a few courses you know have their different colored tee markers so close together it doesn't much matter which set you play from? When you watch the men touring pros on TV, do they make most par-5 holes seem like par-4 holes, in fact, hitting medium or even lofted irons for their second shots on some of the 5s? Perhaps beauty in the length of golf holes is in the drives of the beholder (a poor pun -- probably better stated, that golf holes' beauty should be in eyes of the holder of the driver). A few months ago, I measured the length of the normal-distance shots of eight golfers hitting each club in their bag. A purpose of this measuring was to be able to locate the different sets of tee markers, with a better understanding of how far many golfers really hit their clubs. Such data could be useful in determining the length of the holes for both existing and new golf courses. I chose the eight golfers to represent a type of golfer and included a man and woman from each of the following categories: club professional; low handicap amateur; middle-aged, middle-handicap; and senior. Another of my articles, The Long and Short About Golfers, details their respective hitting distances. A fact quickly became obvious in my measuring of these shots: there was a large spread in hitting distance between golfers. To say it another way, the results showed how far long hitters can hit a golf ball compared to just how short hitters some golfers are. In studying these distance measurements, one fact surprised me. Although golfers varied widely in how far they could hit the ball, the relationship between the distance each hit their different clubs was strikingly similar. 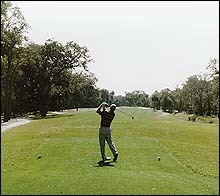 For instance, each of the eight golfers hit their next longest metal wood nearly 88% of the distance of their driver. They hit their 5-iron approximately 70% of the length of their driver and their 9-iron was about 52% of their driver. And these mathematical relationships were close to the same for both men and women. By assuming the distance any golfer hits their driver and using these relationships, you can make a pretty good prediction on how far each will hit his or her other clubs. This information could then be applied to the club any golfer would need to reach the center of the green on golf holes of any length. That is par-3, 4 or 5 holes and those golfers' limits for those holes. My study and write-up was aimed at how course operators, superintendents, tournament committees and golf course architects might better consider the hitting length of different types of golfers in providing courses suited for their daily play and competitions. I want to caution that the method I used can only be for speculating on the clubs needed by golfers for different length holes. The data is based on a very small sample of golfers and the rest was calculated on paper. These figures do not and cannot allow for the many variables in individual golfers, golf holes and playing conditions. An attempt to apply these figures to golf holes of a real golf course should fully relate to the actual conditions existing at that course. Most golfers are not very concerned about generalizations or hypothetical matters. Golfers mainly want to know what club they should hit and how to hit it on the hole they are playing. These figures, however, might be of interest to some golfers in seeing how they compare to these mathematical-model golfers. Using 88% of golfers' driving distance for the length of their second longest metal wood and 70% for their 5-iron shot, the first chart below gives a middle-length par-3, par-4 and par-5 hole. I label the second longest metal wood a fairway metal wood. These length holes are arrived at by assuming a 5-iron is hit from the tee of the par-3 hole. The par-4 hole shown is for a golfer's driver and 5-iron second shot to the middle of the green. The par-5 hole is for a driver, their fairway metal wood and their 5-iron. The next column of this chart are the 18-hole totals obtained from adding four par-3, 10 par-4 and four par-5 middle-length holes. For the second chart, I used the same driving distances and the same percentages of the drives to give the hypothetical limits for par-3, par-4 and par-5 holes. The column I label as the minimum length uses the distance with a 9-iron approach. The next column, called maximum length is with a fairway metal wood approach shot on the holes. All of the distances in these charts are in yards. There are no commonly established groupings of golfers. Each golfer is unique. Here are the general types of golfers I tried to represent in my measuring. The yardage given for the drive of these representatives is the total of the carry of their normal-distance tee shot, accurately measured with a laser instrument, plus adding a factor for roll. 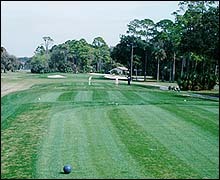 The measuring was done on a flat fairway of a golf course I designed near Daytona Beach. Early in the 1998 season, John Daly is leading in driving distance average on the PGA Tour with 306 yards. The early leader this year on the LPGA Tour is Caroline Blaylock, averaging 275 yards. For 1997, John Jacobs averaged 291 yards on the Senior PGA Tour. Locations for teeing areas for tee markers which, naturally, determine the length of holes are best designed based on the types of golfers who will play that golf course. The teeing areas should also be fitted to the contours of the land on each hole. Particularly on longer courses, a number of sets of tee markers are needed if it is desired to have most golfers use similar clubs on the same hole. Because of the wide spread in the length of golfers, these sets of tee markers must be suitably spaced apart on each hole. An early decision for the developer of a new golf course and a golf course architect should be the goals for that course and the types of golfers who are likely play it. Knowing these will allow the golf course architect to best design the holes, including locating teeing areas. The same is true if an existing golf course is to be remodeled. The course's operator and the golf course architect should know the type of golfers who play that course. Teeing areas on each hole should fit those golfers and fit the land. In comparing the limited hitting length of short hitters with the scorecards of many of today's "regulation" golf courses, it is apparent that short hitters cannot reach the green in regulation on many of the holes. This is true even from the most forward tees. Suitably located teeing areas on the holes and additional sets of markers can solve this. A problem in doing this might be that many golfers and course operators could object to seeing tees scattered so far along the fairways on so many of the holes. A tougher dilemma could be getting golfers, who lack hitting strength and so should use the more forward tees, to play from those markers. One solution to this problem is to construct more new shorter courses primarily for the play of medium and short hitting golfers. On these courses the forward tees will not be and look so much ahead of the back tees. Those courses will also take less land, cost less to construct and cost less to maintain than "championship" or even regulation golf courses. Although not in my study, if a distribution of golfers by their hitting length was made, this could likely show the large number of medium and short hitting golfers. Compared to the scorecard given above, it is obvious that most existing courses do not have enough long holes from the back tees to require the use of a balanced distribution of clubs by long hitters. It takes a lot of land and is more expensive to design, construct and maintain new courses which are long enough to do this. On existing courses, making holes longer also costs money and often is impossible due to the lack of land at the end of the holes. Slightly cutting the distance of golf balls for long hitters, without much of a reduction in the length of the shots of medium and short hitters, is technically rather simple to accomplish. This would somewhat decrease the importance length in golf and have a number of saving benefits.